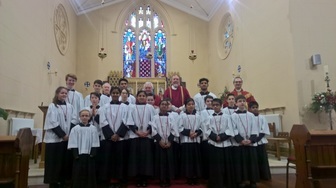 For many years, Our Lady of Mount Carmel parish has been blessed with group of dedicated Altar Servers. After a period of 12 months continual service, they are enrolled into the Guild of St Stephen. St Stephen was chosen as the patron of Altar Servers because he was a dedicated servant in the early Church and gave his life for his belief in Christ. The members of the Guild of St Stephen serve each Sunday at Mass, and sometimes during the week. During their time of training, Altar servers learn to do all of the roles that are needed to ensure that the Mass is celebrated properly, and with reverence. If you would like more information about the Guild of St Stephen, and becoming an Altar Server, please contact one of the priests, or the parish office. Visit the Guild of Saint Stephen website to find out more.